A woman is cooking stew. Silverside is a cut of beef that comes from the upper rear leg of the cow. Silverside is a term used in the United Kingdom, Ireland, Australia and New Zealand. It is better known as beef bottom round in the United States. 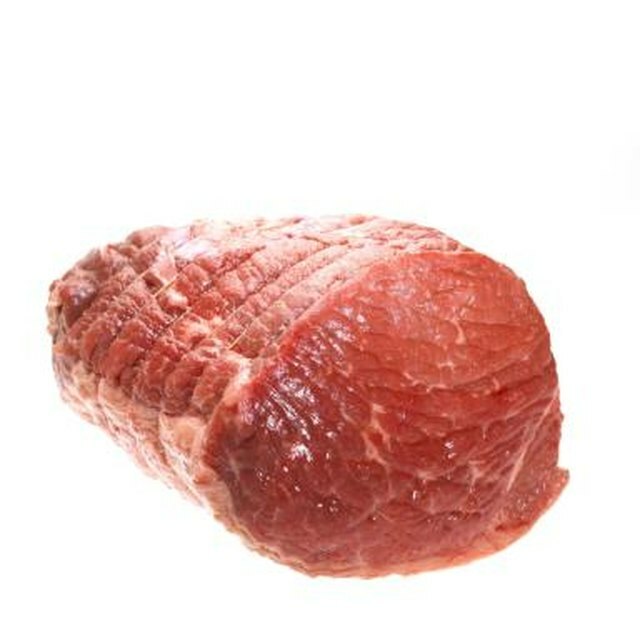 The muscles in the upper rear leg are well exercised, so the silverside cut of beef is relatively tough meat with lots of connective tissue. Silverside should be cut slowly with moist heat and can be cooked on the stove top as a part of beef stew. Silverside is a relatively lean cut of meat. A 3-ounce serving of silverside steak contains 160 calories, 18 g of protein and 9 g of fat, according to the U.S. Department of Agriculture. Rinse and pat dry 2 pounds of silverside beef steak or roast. Cut the beef into 2-inch cubes. Season the beef with ½ tsp. of salt and ½ tsp. of ground black pepper. As an option, you can add 1 tsp. of dried herbs such as thyme, savory and/or oregano. Dredge the beef with ½ cup of all-purpose flour. Shake off any excess flour. Heat 2 tbsp. of olive oil or butter in a large pot over medium-high heat. Add the beef and brown on all sides. Do not overcrowd the pot; cook in batches if necessary. Remove the cooked beef with a slotted spoon and put on a plate. Add ½ cup of chopped onions, ¼ cup of chopped celery and ¼ cup of chopped carrots to the pot. As an option, add 2 tbsp. of minced garlic and/or ¼ cup of chopped leeks. Cover the pot and cook for five minutes or until the onions are soft. Add the browned beef, two bay leaves, ½ tsp. of salt, ½ tsp. of black pepper and ½ tsp. of dried herbs into the pot. Add 3 cups of beef stock, red wine, white wine or a combination of each. Bring to a boil. Reduce the heat and simmer, covered, for two hours or until the beef is tender. Add three carrots, four potatoes, two turnips and two parsnips, all cut into 1-inch chunks, to the pot. Cover and cook for 35 to 40 minutes or until the vegetables are tender. Remove the pot from the stove and skim off any fat that has accumulated on the surface of the stew. Garnish with chopped, fresh parsley. You can cut the silverside in 1/2- to 3-inch cubes. The smaller the cubes, the faster the stew will cook. However, thicker cubes will keep their shape better and longer cooking time will give the stew more flavor.